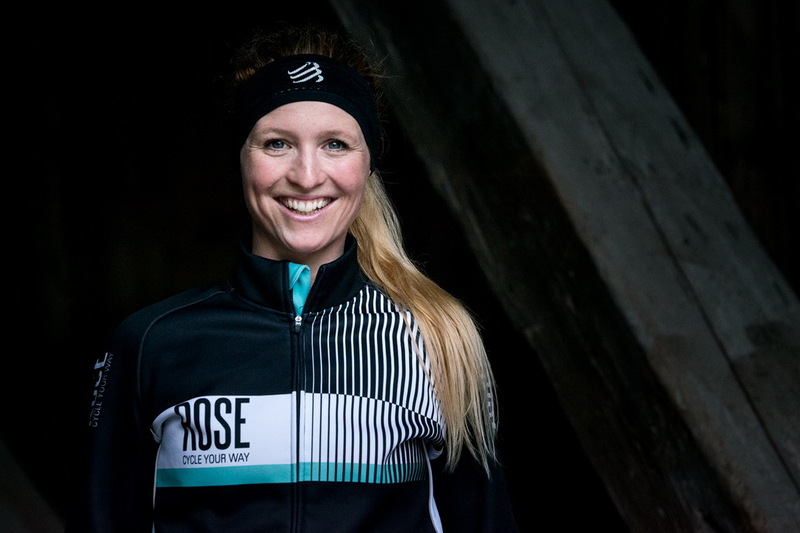 Eva Hürlimann is the first Swiss woman to participate in a quintuple ultratriathlon. At the same time she wants to break the current world record. In the interview, she talks about her strategy and why she never stops smiling. Her list of achievements is full of podium finishes. Short triathlon distances, road races, Ironman. And Gigathlon: Right at the first participation in 2016, Eva Hürlimann won the Single Ladies Gigathlon Switzerland. In 2017 she also won the Gigathlon in the Czech Republic. As a girl, Eva practiced figure skating for eight years. This was followed by swimming, cycling, jogging and ended in the first triathlon in her early 20ies. Wherever Eva gets involved, she is in the forefront: As the mother of three children between the ages of three and seven years old, she dedicates a lot of free time to sports. With high goals, lots of ambition, a lot of fun and a great supporter: her husband Hugi, who once finished a double ultratriathlon. Eva, your husband Hugi will also support you at the Quintuple in Buchs. Anyway, it was his idea to do an ultratriathlon race, right? Eva Hürlimann: That's right! Last year, Hugi showed me an article about the swissultra race in a magazine and said, "That would be something for you!". This idea came just at the right time. After some Gigathlon participations, I was looking for a new challenge. At the finish line, I always had the feeling that I could go on – so I think my husband is right: I have a body and mind for very long distances. In Gigathlon races, every second counts. In ultratriathlon races, the focus is rather on hours – or the question: how well you can torture yourself? You will not see me suffer greatly. I do not torture myself, I enjoy sports! To do sports for five days is pure joy for me. Sure, pain will come, but I can handle that. I have never lost the joy and I'm confident that it will be similar with the Quintuple. The world record is an ambitious goal, but a realistic one. I have to finish the Ironman in less than 15 hours a day. Of course, it is difficult to guess how the body responds to such a physical strain over several days. But in the end it does not matter if I break the record, if I win the race or if I just finish. I want to have a good time and come back home healthy. Many people shake their heads, consider ultratriathlon as an unhealthy and crazy sport - how do you react to such prejudices? Crazy or meaningless – yes, I've already heard that. It's all a question of perspective: For me, a football game does not make sense neither! But I have also received positive feedbacks. People talk to me, on the street or write me on social media. Some people admire and encourage me, others do not fully understand my intention. That's okay too – live and let live. Nobody can imagine how to do triathlon for five days – I love the idea because for me, sport is more than a hobby. My sponsors also reacted positively; ROSE Bikes supports me and I will be able to intensively test Compressport oder BEMER for regeneration. What comes after the quintuple – maybe a DECA Continuous or the Race Across America (RAAM)? The RAAM rather not, "only" cycling would be too one-sided and not to reconcile with the family situation. I love the variety of triathlon. Regarding the DECA Continuous, I still have a lot of respect for sleep deprivation. I do not know yet how to handle it. The Deca is therefore more of a long-haul goal. First of all, I would like to gain experience with Quintuple, get used to ultratriathlon and learn from the other athletes. Okay, let's stay with the quintuple: how do you prepare for it? I try to do good quality trainings and to combine the training time with the family. Sure, I have to do longer training sessions and I have already set a focus on running. I have respect for the five marathons. Soon we will travel to Spain for two weeks, where I am engaged as a group leader in a training camp. That, of course, is also a great workout! Do you already have a strategy for the race itself? I certainly will not start too fast. I would like to take the first two or three days slowly. My strength is the longer race mode; In the end, I can easily go faster, if everything is right. And how do you motivate yourself? I rarely have motivation problems! When I'm tired, I set a short-term goal like the next transition zone and eat something. As a mother of three, I do not have much time for myself, so I enjoy the competition time. It’s "me time" only. I am full of anticipation for the swissultra. I feel already very warm welcomed by the scene and the other athletes, that's a great feeling. The ultratriathlon family is really nice!